George Gilder is a guru who got many things right over decades, and therefore his thoughts on the future of cryptocurrencies and blockchain technology deserve very careful consideration. 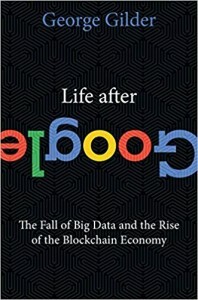 George Gilder has a new book titled "Life After Google: The Fall of Big Data and the Rise of the Blockchain Economy", published on July 17. "Gilder likens the current situation - the dominance of Google, Apple and Facebook - to a time when humans thought the world was flat," explains a Financial Times review of the best business books for summer 2018. "Our system is 2D, and we will evolve into a 3D one, as it is unlikely that major issues — such as cyber security and privacy, for example - can be solved within the computer systems and networks we use today." "The author believes that the likes of blockchain and bitcoins will fundamentally change the system because their very nature will lead to more widely distributed computer power and commerce." "In writing Life After Google, George Gilder has outdone himself," says Ralph Benko in a review just published in The American Spectator. "The author of the bible of the Reagan Revolution has now written the bible of the Cryptocosm. The Cryptocosm is a technological breakthrough that promises to transform every aspect of our lives." "A totally insecure Internet is being addressed globally by the movement toward blockchain: distributed security, a 'layer-eight' new security architecture for the Internet," said Gilder in a Forbes interview in February, before the book was published. "A Blockstack to replace the increasingly perforated Internet stack. So, yes, I think that the foundations for an era of very rapid growth exist, which is what my book Life After Google is all about." Gilder's new book includes an up-to-date account of the history of the computer and internet industries, with a detailed zoom on the latest revolutionary development, the blockchain. Why Is the ‘Resistance’ Harassing This Man? Government Controlled Internet: What's At Stake?